Profitable industrial print production demands creative, flexible and cost-effective digital solutions. Mimaki will therefore be displaying a versatile portfolio of printing solutions at InPrint 2015, Munich Trade Fair, November 10 to 12, Hall A6, Stand A11. The brand new Mimaki UJF-7151 plus on-demand solution for the screen printing industry will be the eye catcher of the stand. Ensuring high quality printing and top level productivity with accurate ink droplet placement, the UJF-7151 plus has a maximum printable size of 710 x 510 mm (28 x 20in). The best digital on-demand industrial small format printing solution for the screen printing industry improves accuracy, consistency and reliability by modifying the mechanical structure of the print table. Fine lines, edges, and small texts are displayed crystal clear. The solution also enables double-layer printing and colour printing on a white base layer. 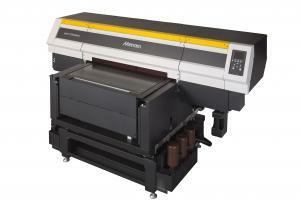 It will be demonstrated alongside the smaller footprint Mimaki JFX200-2513 wide format flatbed printer. Able to print onto thick substrates, it can produce a diverse range of prints for both indoor and outdoor use. It is ideally suited for applications such as backlit displays, signs and posters, interior décor, glass and metal decorative panels. White, clear and inks are available. The Original Goods Package System (OGPS), is a joint development with Esko that simplifies the digital packaging production for companies that produce packaging samples and mock-ups, as well as small packing runs and personalised packaged goods. It features Esko’s ArtiosCAD Designer Solution, Mimaki’s UJF-6042 LED UV inkjet flatbed printer and Mimaki’s CFL-605RT cutting plotter. Marcus Timson, Co-Founder of InPrint, adds: “Industrial print continues to grow. According to I.T. Strategies in a special report written for InPrint Show, the pace of growth has accelerated with a cumulative average of 36% across all segments between 2012-2020. This is positive news for all our exhibitors and the development of this sector, which InPrint Show is dedicated to supporting. We are delighted that strategic partners such as Mimaki are finding it an excellent platform to expand their customer base and look forward to seeing their industrial print technologies at InPrint 2015.